Crete is a land of saints and heroes. It has a long spiritual tradition, which includes its historical monuments, churches, monasteries, mountains & other places of rare natural beauty. 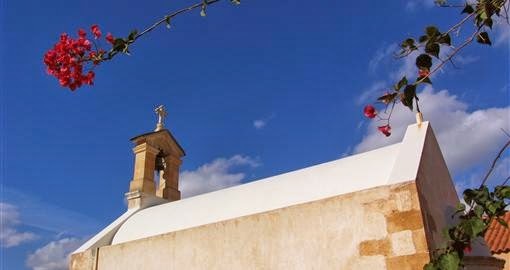 Throughout its long history, Crete has always been a place if intense spirituality and religiousness. The proof are the numerous places of worship, as it is witnessed by the remains of temples dedicated to ancient Minoan and Greek deities, the peak sanctuaries dedicated to Zeus, the countless churches of the Byzantine and post-Byzantine period, the humble chapels scattered in the countryside of Crete. Also, the numerous monasteries hiding valuable treasures and sacred relics, ready to welcome the visitor who wants to experience spirituality in their simple, but hospitable cells. You actually feel you are talking to god, because of the amazing natural environment where they are built. The church of Crete has apostolic roots and is connected to the apostolic work of apostle Paul. He founded Christianity on the island, after having visited Crete and especially Heraklion twice. He consecrated the most active of his companions, Titus, as first Bishop of Crete, established in the then thriving and populous city of Gortys. People responded to the preaching work of Titus and his successors and despite the persecutions of the Romans and the apparent action of the heretics, Christianity was spread very quickly. Actually, in the 6th century a majestic church was built in honor of Apostle Titus in Gortys, a part of which is preserved until today. The oppression and the islamization efforts of the Arabs and the Ottomans didn’t have a negative impact and there were no shifts or alterations in religion, the language, the customs and the traditions en general, as it was believed in the past. The heterodox Venetians put pressure on the upper clergy and eliminated the orthodox bishops. However, the churches were managed by the so-called protopapades (head priests), who had limited powers. The protopapades along with the orthodox clergy and the people supported the orthodox faith and strengthened the religious feeling. Brilliant churches, as well as male and female Latin monasteries were built in Heraklion. The seat of the Latin Archbishop was the church of Apostle Titus, which was built during the second Byzantine period and later. The re-establishment of the Cathedral and the bishops, who had been abolished by the Venetians, was a basic remedial action of the Turks, aiming to psychologically influence the orthodox people of Crete. Neophytos Patellaros was ordained first Orthodox Metropolitan of Crete, based in Heraklion, even before the occupation of the city by the Turks. The tax paid by the Metropolitan to the Turkish fund, which was passing on to the Christians, was exorbitant. Although Christians were paying another tax, the so-called “patriarchal” tax, they didn’t have a church. The Cathedral, the today’s small church of Saint Minas, was made with many difficulties and obstacles. The inauguration of Saint Minas Cathedral took place on 10 November 1735. The same church also became a place of martyrdom of six prelates who were slaughtered on 24 June 1821. All Christian churches were converted into mosques. These places, because of their religiousness , offer generously to the visitor an alternative lifestyle, away from the alienation and decadence of modern times. The modern man, tired of the overwhelming way of life in the world’s big cities, arrives in Crete, an island with a special personality and identity, and discovers human warmth and communication, hospitality and answers to metaphysical questions, as the relation between the earth and the heaven is still tangible here. The entrance of the visitors in a humble chapel or in a monastery is an opportunity to approach the orthodox tradition of the island. This tradition is expressed with the mystic atmosphere and the devoutness of the Byzantine icons and the psalmody, as well as with the hospitality in the feasts, where people from every part of the world are welcomed as friends. Even today the visitor will encounter pilgrims walking for hours in order to reach achapel on the mountain, and there, after the Liturgy, they share their food with all the people who are present. Close to the churches, the visitor can also discover springs of holy water, which are used by the local people for many centuries. The stone houses of the villages, as well as the stone-built churches, cisterns and bridges, are the expression of the soul of the people who have been building with the materials provided by nature and in harmony with the environment, without architectural plans and economic program and without knowing that the result is what we call today “sustainable development”. The growingorganic farming is also particularly interesting for the visitors of the island. There are many leading monasteries that apply this method in order to preserve the natural environment as well as to realize the sanctity of nature. The Cretan olive oil is known worldwide for its beneficial properties and its therapeutic effect. It is very important that the large monasteries of the island produce organic olive oil. Also, the people from abroad who come to Crete in the context of scientific programs of religious tourism and are interested in issues related to energy saving, by visiting the monasteries, they have the opportunity to observe the bioclimatic architecture, the application of renewable sources of energy and the utilization of water resources. The acquaintance with the religious monuments and the sacred memories of Crete, as well as the deep sense they convey, is associated with the pursuit of a spiritual lifestyle, based on theauthentic traditional values. This is why the monuments of this place are not just simple museum items or lifeless transmitters of information. On the contrary, they have an intense presence in the island’s cultural tradition, being a reflection of the island’s soul a message of hope and renewal, and therefore, in nowadays they keep inspiring us and giving a different meaning of life to the visitor of Crete.